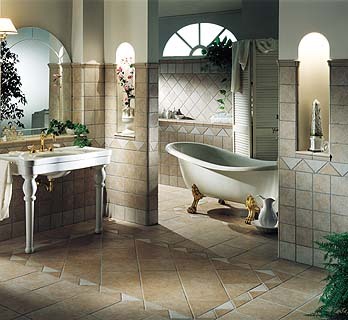 Ceramic Tile provides one of the most durable, practical, and hygienic surfacing materials available. It is important, however, to understand that a ceramic tile installation is not maintenance-free. The following guide will provide a realistic and practical understanding in dealing with necessary Care and Maintenance considerations. Reduces and simplifies ongoing maintenance. Improves hygienic benefits on a clean surface. Preserves and enhances tile and grout appearance. Prolongs life of tile installation. Use vinegar & water as a routine cleaner Acidic: regular use can damage grout and acid-sensitive glazes. In addition, acids are poor degreasers. Use Muriatic Acid on Ceramic Tile and Grout *Very strong and hazardous fumes can etch acid-sensitive surfaces, damage lungs, corrode any metallic finishes. Imply that ceramic tile is maintenance free Low maintenance is the reality. It can easily be maintained with Ideal 250 tile cleaner. Please follow recommended procedure. Use lemon oil to treat soil & grout Never cures. Attracts dust and airborne contaminant. Poor sealing qualities; quickly fades. *Use most grocery store tile cleaners Majority of these can contain acid or other harsh chemicals and cause eventual damage. Use scouring powders and abrasives They physically -abrade tile and even porcelain fixtures with regular use. Do: use Ideal 250 Tile Cleaner. Today's grouts are far superior to grouts of old. It is still a fact, however, that all cement grout joints are porous ( even those utilizing additives in their mix ). In addition, many of today's grout sealers can be applied after proper grout curing time, easily by the homeowner. With this in mind, every grout joint installation with the exception of epoxy will provide the benefits of easier ongoing maintenance. It should also be noted that due to a variety of conditions, some unavoidable, cement-based grout many not cure at the same speed and may develop a blotchy or uneven color. Do: use Ideal 250 Tile Cleaner for effective cleaning. * For special/specific cleaning problems, please email us.